Aims: The aim of this study was to determine the effects of daytime aerobic exercise on the subsequent sleep and appetite of obese women. Materials and Methods: It was a semi-experimental study with pre and post-test design. Fifteen obese women were asked to do aerobic exercises three sessions a week for 2 weeks, with each session lasting 60 min at 60% of maximum heart rate either at 9:00 am or 18:00 pm. A body composition analyzer (InBody-320, South Korea) was used to measure weight, fat percentage, and body mass index (BMI). Nocturnal sleep–wake schedule data and sleep patterns in the two conditions (morning vs. evening) were recorded at 1-min intervals and scored with the Actiwatch Sleep Analysis 8 software. Paired t-test and independent t-test were used to analyze the data. Results: Results (age, 46.9 ± 5.2 years; BMI, 33.6 ± 3.2 kg/m2; and percentage of body fat ≥35%) showed that sleep efficiency, wake bouts, actual sleep, and sleep latency were improved after exercise training (P ≤ 0.05). Furthermore, morning exercise condition resulted in a better improvement in sleep efficiency (73.41% ± 6.94%), wake bouts (15.81% ± 3.30%), and sleep latency (79.47% ± 6.09%) compared to that of evening exercise (P ≤ 0.05). It was also reported that the perceived satiety was not significantly different in the two conditions (P = 0.94 and P = 0.076, respectively, for morning and evening), while the perceived hungry was improved significantly in the morning condition (P = 0.003). Conclusion: As a result, aerobic exercises at the time of the morning can lead to a better quality of sleep and decline in hungry of obese women compared to the evening exercise. Obesity is one of the greatest challenges that threaten the health of communities in the last century. Considering the limitations of obesity prevention and treatment strategies, a lot of attention has recently been devoted to obesity and health-related threats. Among these risk factors, sleep disturbance is one of the consequences of obesity, which can be a factor in the aggravation of obesity. Although the relationship between obesity and sleep disorders has been reported across all age groups, the importance of other dimensions of sleep patterns, such as regularity of sleep, total sleep time, sleep latency, and sleep efficacy, has been less studied. A study found that adults with later bedtimes had more calories and were more obese. Exercise has always been considered as a key strategy for the prevention and treatment of obesity and sleep disorders,, as evidenced by the fact that people with optimal physical fitness are less likely to experience sleep disorders. Previous studies show that aerobic exercise increases the depth and quality of sleep and also reduces sleep latency., One of the concerns that researchers have about the effectiveness of exercise is the daytime effects. There is an extensive body of literature which demonstrates that exercise in the evening raises core body temperature, and then an increased tendency to fall asleep is found following drop in body temperature. It should be noted that most studies examining the effects of exercise on sleep have focused on young good sleepers or fit athletes. The limited data available in older adults also indicate an association between physical activity levels and sleep quality. For example, older physically fit men had shorter sleep-onset latencies, less wake time after sleep onset, higher sleep efficiency, and more total slow wave sleep than sedentary older men. Appetite is another factor that may mediate the interactions between sleep disorder and obesity. In this regard, there are a number of hormones that cause a connection between the loss of sleep quality and appetite. There are two peptides called leptin and ghrelin that affect appetite and ultimately determine the state of weight gain in people. Leptin is a hormone secreted from adipocyte that lowers appetite and, by the way, ghrelin is a hormone secreted from peptides of the stomach that stimulates appetite. Since sleep health and appetite control is a factor that can have positive physiological outcomes for middle-aged people in later life, this study attempted to study the effects of training in different times of the day on different aspects of sleep patterns and appetite. It should be noted that previous studies have not focused on the effects of different daytime exercises on sleep patterns along with appetite levels, so the aim of our study was to determine if daytime exercise exerts positive effects on sleep quality and appetite in middle-aged women. It was assumed that aerobic exercises improve the quality of sleep by decreasing the percentage of body fat, especially visceral fat, as well as changes in appetite hormones, but the question is whether exercise at a different time can be more effective in these possible outcomes? A total of 15 obese middle-aged women were included in this crossover study based on purposeful sampling (age, 46.9 ± 5.2 years and body mass index (BMI), 33.6 ± 3.2 kg/m2) who attended the Weight Control Clinic, Qazvin, Iran. Those who suffered from sleep loss were selected voluntarily and divided randomly into two exercise modes (morning exercise vs. evening exercise). The following inclusion criteria were also considered: score ≥5 on Pittsburgh Sleep Quality Index (PSQI); having conditions for doing exercise on the basis of Physical Activity Readiness Questionnaire; consumption of ≤3 cups of coffee per day; no use of medication that could interfere with the study's objective, and percentage of body fat ≥35%. A body composition analyzer (InBody-320, South Korea) was used to measure weight, fat percentage, and BMI. All measurements were taken while participants were instructed to refrain from eating and drinking at least 2 h before testing. The information of sleep–wake schedules was collected using the PSQI for a 3-day period before the experiment. Prior to starting exercise protocol, baseline test was performed. In the 2nd week of exercise training, their sleep patterns were evaluated as posttest. Nocturnal sleep–wake schedule data and sleep patterns in the two conditions (morning vs. evening) were recorded at 1-min intervals and scored with the Actiwatch (AW64, Cambridge Neurotechnology Ltd., Cambridge, UK). The participants were monitored using wrist actigraphy throughout the experiment. The Actiwatch has been validated against polysomnography in sleep studies., Since the intake of micronutrients and macronutrients has a significant effect on blood test results, a 24-h questionnaire (to control the participants' nutrition) was used the day before the pretest and posttest to control this factor. The N4 nutrient processing software program (version 3.5.2) was used to analyze the food intake. The instrument used for appetite measurement was Visual Analog Scale consisting of questions concerning perceived satiety and hungry. Paired t-test and independent t-test were used to analyze the data. The aerobic exercise protocol included warming up (5 min); the main program (30 min of jogging) and cooling down (5 min) phases lasted for 14 consecutive weeks. The main program consisted of jogging with moderate intensity (heart rate [HR]max of 65%–75%). All protocols were performed at Helal Ahmar Club, Qazvin, Iran. The exercise intensity was monitored by using the Polar HR checker (Polar RS 400, Polar Electro Oy, Kempele, Finland). The study was approved by the Ethics Committee Board of Imam Khomeini International University (ID: 17628). Informed consent was signed by participants prior to the beginning of study. The authors confirm that all ongoing and related trials for this intervention are registered. The results indicated no significant difference on food assessment of participants in the day before the pretest in both conditions (P ≥ 0.05). 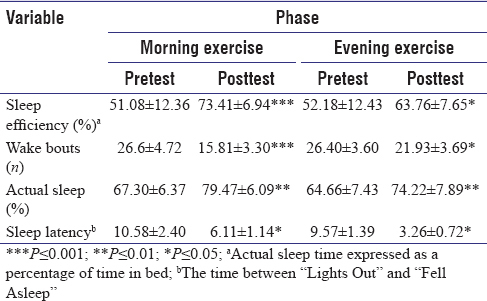 As shown in [Table 1], all sleep measures improved significantly after exercise intervention (dependent t-test) (P ≥ 0.05). (morning exercise: sleep efficiency [73.41% ± 6.94%], wake bouts [15.81% ± 3.30%], actual sleep [79.47% ± 6.09%], and sleep latency [6.11% ± 1.14%]). The results of independent t-test indicated that sleep efficiency (P = 0.004; t = 3.20), wake bouts (P = 0.001; t = 4.65), and sleep latency (P = 0.012; t = 2.709) significantly improved in the morning condition, while no significant difference was found in actual sleep in the two conditions (P = 0.31; t = 1.33). 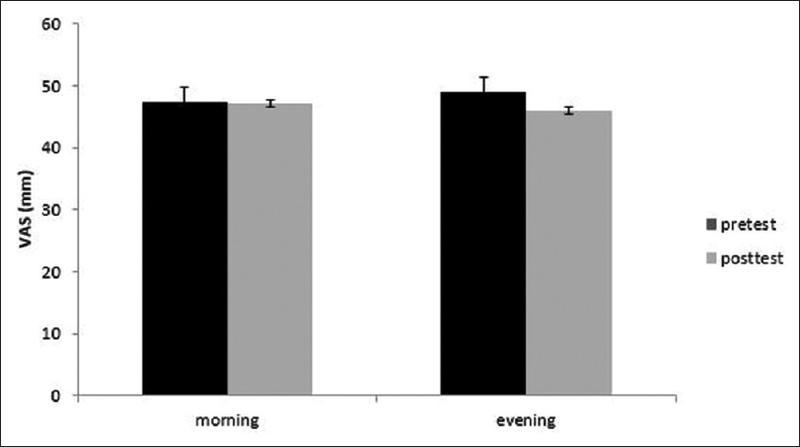 As shown in [Figure 1], the perceived satiety declined in the two conditions, while it was not significantly different (P = 0.94 and P = 0.076, respectively, for morning and evening). Independent t-test suggested that significant difference was not found for perceived satiety in the two conditions (P = 0.22; t = 1.240). 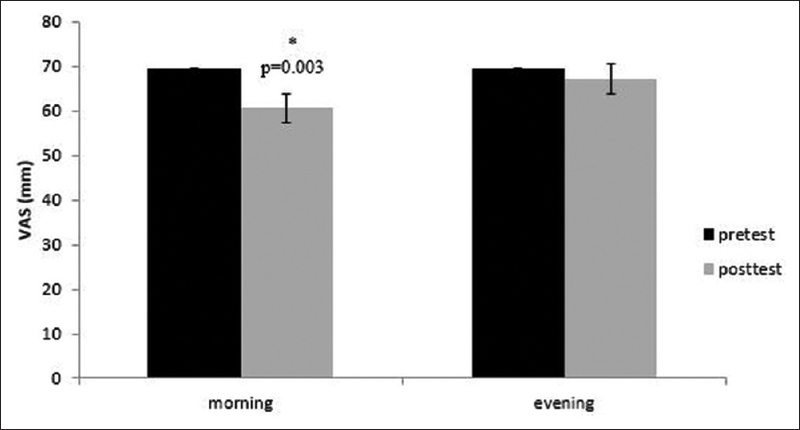 As shown in [Figure 2], the perceived hungry declined significantly in the morning condition (P = 0.003), while it did not significantly decline in the evening condition (P = 0.20). Furthermore, a significant difference was found for perceived hungry in the two conditions (P = 0.01; t = − 2.8.25). Increased prevalence of sleep disorders among obese women has caused researchers to identify the best possible preventive strategies before starting treatment. Therefore, the purpose of this study was to investigate the effects of daytime exercise on the sleep quality and appetite of obese women. As indicated in the results' section, all sleep indices in both treatments significantly improved as compared to baseline, while in the appetite indices, morning exercises resulted in reduced hungry sense in participants. On comparison of the two conditions, morning exercise had more advantages for perceived hungry, sleep efficiency, bouts of wakes, and sleep latency. On justifying the results, it can be argued that in general, exercise has led to the release of relaxing hormones in the body, which, according to a previous research, improves the quality of sleep. However, in comparison to the two practice modes, one can point out that exercising in the afternoon increases the body core temperature and, as a result, as arousal increases, more consciousness is created which reduces the depth of sleep. Another possible explanation for the obtained results can be due to body composition changes. As it turned out, participants in both conditions had a significant change in abdominal obesity and weight after interventions. In addition, our finding provides some insight into the constructive effect of aerobic exercise protocol on quality of sleep that is consistent with the findings of Irandoust and Taheri who reported the positive effect of exercise on the quality of sleep. Another finding of this study was the highest improvement of sleep quality in morning exercise condition. As suggested, exercise as a treatment is not specific to maintaining sleep health, but also extends to improving the perceived hungry in obese women.,,, One of the influential factors for higher efficacy of exercise in the morning for hunger control is that physical activity causes glycogen depletion in the liver and muscles as well as a drop in blood glucose, which increases the need for food replacement.,,,, Therefore, it seems logical that exercise in the morning condition would result in controlling the hunger sense, consistent with several studies.,, One limitation of the research was the small number of study participants, limiting the extent to which the results can be applied to middle-aged women in general. Additional studies involving more individuals and a more controlled environment with different varieties of psychological and physical tests are required in order to make conclusive assumptions about a larger population. Aerobic exercises at morning can lead to better quality of sleep and decline in hunger of obese women compared to the evening exercise. The authors would like to thank Imam Khomeini International University for granting research. This study was supported by Imam Khomeini International University. Chaput JP. Sleep patterns, diet quality and energy balance. Physiol Behav 2014;134:86-91. Irandoost K, Taheri M, Seghatoleslami A. The effects of weight loss by physical activity and diet on depression levels of highly depressed elderly females. Iran J Ageing 2015;10:48-53. Taheri M, Irandoust K. The exercise-induced weight loss improves self-reported quality of sleep in obese elderly women with sleep disorders. Sleep Hypn 2018;20:54-9. Sherrill DL, Kotchou K, Quan SF. Association of physical activity and human sleep disorders. Arch Intern Med 1998;158:1894-8. Reid KJ, Baron KG, Lu B, Naylor E, Wolfe L, Zee PC. Aerobic exercise improves self-reported sleep and quality of life in older adults with insomnia. Sleep Med 2010;11:934-40. Yang PY, Ho KH, Chen HC, Chien MY. Exercise training improves sleep quality in middle-aged and older adults with sleep problems: A systematic review. J Physiother 2012;58:157-63. Klok MD, Jakobsdottir S, Drent ML. The role of leptin and ghrelin in the regulation of food intake and body weight in humans: A review. Obes Rev 2007;8:21-34. Laursen TL, Zak RB, Shute RJ, Heesch MW, Dinan NE, Bubak MP, et al. Leptin, adiponectin, and ghrelin responses to endurance exercise in different ambient conditions. Temperature (Austin) 2017;4:166-75. Morgenthaler T, Alessi C, Friedman L, Owens J, Kapur V, Boehlecke B, et al. Practice parameters for the use of actigraphy in the assessment of sleep and sleep disorders: An update for 2007. Sleep 2007;30:519-29. Kushida CA, Chang A, Gadkary C, Guilleminault C, Carrillo O, Dement WC. Comparison of actigraphic, polysomnographic, and subjective assessment of sleep parameters in sleep-disordered patients. Sleep Med 2001;2:389-96. Paoli A, Bianco A. Not all exercises are created equal. Am J Cardiol 2012;109:305. Lee HC, Heo T. Effects of exercise therapy on blood lipids of obese women. J Phys Ther Sci 2014;26:1675-7. Uchida S, Shioda K, Morita Y, Kubota C, Ganeko M, Takeda N. Exercise effects on sleep physiology. Front Neurol 2012;3:48. Irandoust K, Taheri M. The effect of strength training on quality of sleep and psychomotor performance in elderly males. Sleep Hypn 2018;20:160-5. Hargens TA, Kaleth AS, Edwards ES, Butner KL. Association between sleep disorders, obesity, and exercise: A review. Nat Sci Sleep 2013;5:27-35. Atkinson G, Fullick S, Grindey C, Maclaren D. Exercise, energy balance and the shift worker. Sports Med 2008;38:671-85. Pooranfar S, Shakoor E, Shafahi M, Salesi M, Karimi M, Roozbeh J, et al. The effect of exercise training on quality and quantity of sleep and lipid profile in renal transplant patients: A randomized clinical trial. Int J Organ Transplant Med 2014;5:157-65. Tiryaki-Sonmez G, Ozen S, Bugdayci G, Karli U, Ozen G, Cogalgil S, et al. Effect of exercise on appetite-regulating hormones in overweight women. Biol Sport 2013;30:75-80.
van Loon LJ, Greenhaff PL, Constantin-Teodosiu D, Saris WH, Wagenmakers AJ. The effects of increasing exercise intensity on muscle fuel utilisation in humans. J Physiol 2001;536:295-304. Hagobian TA, Yamashiro M, Hinkel-Lipsker J, Streder K, Evero N, Hackney T. Effects of acute exercise on appetite hormones and adlibitum energy intake in men and women. Appl Physiol Nutr Metab 2013;38:66-72. Larson-Meyer DE, Palm S, Bansal A, Austin KJ, Hart AM, Alexander BM. Influence of running and walking on hormonal regulators of appetite in women. J Obes 2012;2012:730409. Schubert MM, Desbrow B, Sabapathy S, Leveritt M. Acute exercise and subsequent energy intake. A meta-analysis. Appetite 2013;63:92-104. King NA, Lluch A, Stubbs RJ, Blundell JE. High dose exercise does not increase hunger or energy intake in free living males. Eur J Clin Nutr 1997;51:478-83. King NA, Snell L, Smith RD, Blundell JE. Effects of short-term exercise on appetite responses in unrestrained females. Eur J Clin Nutr 1996;50:663-7. Kissileff HR, Pi-Sunyer FX, Segal K, Meltzer S, Foelsch PA. Acute effects of exercise on food intake in obese and nonobese women. Am J Clin Nutr 1990;52:240-5.